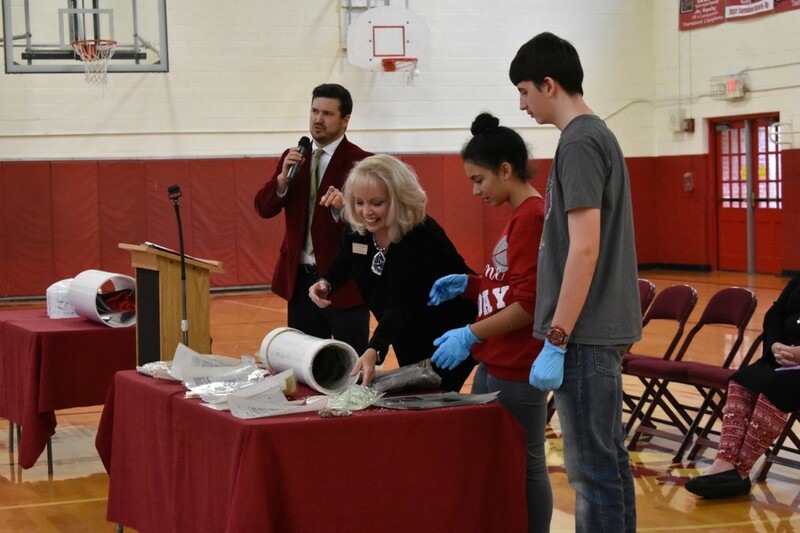 Fall Branch Principal Mark Merriman, former principal Susan Kiernan, and students Alyssa Sears and Aidan Monette revealed the items buried in the time capsule in 1993 at Monday’s event at the school. In the summer of 1993, Bill Clinton was the president, Janet Jackson had a hit song on the radio, cell phones were nearly the size of your face and a time capsule was buried in the ground at Fall Branch Elementary School. photo of Susan Kiernan, the principal at Fall Branch in 1993, was just one of the treasures uncovered. And on Monday, Nov. 26 — 25 years later — that time capsule was uncovered. The time capsule — opened by current Fall Branch Principal Mark Merriman, Kiernan and two Fall Branch students during Monday’s event at the school — contained items such as newspapers from 1993, a copy of the deed to the school, a laminated history of the school and Fall Branch community, picture albums and a video tape from 1993. In addition to the items found in the 25-year-old capsule, the former principal read her remarks from 1993 to alumni, community members, and the current students of Fall Branch. For some, however, the capsule held more than just ‘90s memorabilia. Alumni, students and community members gather around the time capsule items. After the time capsule had been carefully unearthed and unpacked, alumni and community members were invited to look through the items and step back in time to relive history. For former Fall Branch students, Kaylan Ferguson and Kensey Brown, the event served as a chance to look back on those memories and to go back to the place they once called home. Now, history will continue on. Fall Branch will now replace the 1993 time capsule with a 2018 one, filled with newspapers, Pokemon cards, Fall Branch memorabilia, a jump drive downloaded with pictures, school event programs, the student newspaper and a 2018 yearbook. But the time capsules provide more than just an exciting event, Merriman said. He also said he felt the time capsules are a great way to preserve history and create an interest in the past and future. “It’s important because it creates a flashback on what it looked like 25 years ago,” Merriman said. “It also creates a conversation for students and they’re going to get a chance to look at things like a VHS tape or the deed to the school or the newspapers back then. Though it will be another 25 years before the newest time capsule is dug up in Fall Branch, there could be another time capsule unveiling in at the school before then, as multiple alumni said they remembered another time capsule being buried on the school’s campus. For now, Kiernan’s advice to the newest generation of time capsule students focused on making the years count rather than counting the years, which she said have a tendency to fly by. “I am amazed at how quickly 25 years passed,” Kiernan said after the time capsule had been presented. “Some of my best memories were in this school building first as a student, but during the rest of my school years here at Fall Branch … I have great memories of Fall Branch.